From the Editor: Melody Lindsey Roane is the director of the Virginia Rehabilitation Center for the Blind and Vision Impaired in Richmond, Virginia. During the past twenty-three years she has directed training programs for the blind in Virginia, Michigan, and Alaska and worked as a vocational rehabilitation counselor in New Mexico. Melody learned about the NFB through the national scholarship program when she was a senior in high school in Florida. Over the ensuing years, she served as a board member in the Florida and Michigan affiliates and as the affiliate president in Alaska. She currently serves as the president of the National Association of Blind Rehabilitation Professionals, and she and her husband, Mark, participate actively in the NFB’s Virginia affiliate. I first met Melody when she was a bubbly young student, and she took the time to compliment me on a speech I had given at a state convention she attended. That gave me good reason to remember her name, but her energy and enthusiasm have come to cement her in my mind more than any kind words about a speech that even I don’t remember now. Melody has been a leader in every place she has lived, always letting her Federationism shine for those who know her to see. This tribute is her way of saying thank you to one of the people who figured prominently in allowing that light to shine through her, and what a wonderful tribute it is. Here is what Melody says about her friend and mentor, Arlene. How do you honor a woman who taught her students so enthusiastically, believed so strongly in their potential, and gave so freely so that others may catch the spark that would fuel a dream and inspire a life? This is the question I ponder as I write this article about Arlene Hill, a gifted, talented and well-loved teacher at the Louisiana Center for the Blind who passed away on Monday, November 13, 2017. How do you do justice to someone who lived the lessons she taught? It was December 1990 when I entered the Louisiana Center for the Blind as a twenty-one-year-old college graduate who struggled with a lot of insecurities, trying to find my place in this world. Arlene was my cane travel instructor, and soon I discovered that she had a great sense of adventure and fun which matched my own. I was going to learn so much, and I couldn’t wait to get started. Every lesson became a great adventure, adding new addresses to her repertoire and helping me develop problem-solving skills and endurance. Insecurities quickly disappeared, replaced by a sense of freedom and confidence. As I gained a firm belief in my cane travel abilities, Arlene threw challenges at me during each lesson, which I embraced eagerly. They weren’t always easy, and sometimes they were downright bizarre. One day I went into Arlene’s office, and she told me that today’s lesson was to locate Sarah’s Kitchen, a wonderful restaurant in Ruston back in the old days that was operated out of Sarah’s house. The directions went something like this: After you pass the cemetery, take the first right, go down to the third street and turn left; when you hear the second dog bark, turn right. You cross over the second hill, then take the gravel driveway to the right, and you SHOULD be there.” It was always an awesome feeling when you actually arrived there without too many complications like one of the dogs not barking. I loved it! Ruston has grown a great deal since I was a student. Because of my training and role models like Arlene who shared the NFB philosophy with me, I am convinced that blind people can learn excellent travel skills and apply them in towns, cities, the heartland of the USA, and in other countries. Over the years, I have lived in Alaska, New Mexico, Michigan, and now Virginia, and no matter where I was living, the problem-solving and analytical skills I learned from Arlene prepared me to travel successfully and confidently in all environments. Arlene demonstrated the unique ability to serve as a mentor and teacher to her students, as well as a colleague and friend, and there was no conflict. This characteristic is best illustrated by the following reflections from Pam Allen, executive director of the Louisiana Center for the Blind: “Arlene was my instructor, then my coworker, and then my employee, and in those roles we were always friends. There was never any awkwardness in the transitions. I am forever grateful. She taught me so much.” She lived what she taught, and when people ask me about the differences in training center philosophies, this ability to put into practice what you teach is one of them. Arlene also contributed to the writing of the book, Techniques Used by Blind Cane Travel Instructors: A practical approach: Learning, Teaching, Believing which demystifies the strategies blind cane travel instructors use to teach travel skills to blind students. When the Center closed for short holidays, Arlene invited me to stay with her family which I appreciated greatly since my home was in Florida. Rather than spending my time as a passive guest, Arlene invited me to help out with various jobs in the kitchen. I felt like I was a part of the family. She shared her tips and strategies for cooking and baking which I still use today. In her unassuming way, she taught me that respect and belief don’t have to be demonstrated just in the classroom. She was a great role model and was always willing to give more so that others could find their dreams. It was not just an eight-to-five job for her; it was a lifestyle. It is rare to find that personal quality. This is not just my story. There are countless stories of successful blind women and men who say they learned from Arlene. My husband, Mark, told me the story about when he was a student at the Louisiana Center for the Blind, and Arlene allowed him and another student to build a deck on the back of her house and teach her daughter, Valerie, and Valerie’s husband, Sam, how to build a deck. 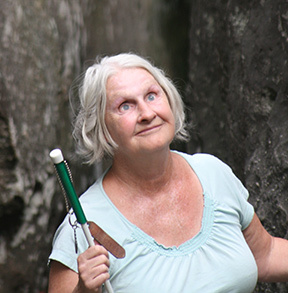 “There aren’t too many people who would have that much belief in you to invest that much money in the project so that we could know that blindness had not diminished our skills; it just challenges us to develop alternative techniques to do the same things we would do if we were still sighted.” Arlene lived her belief in the abilities of blind people, and because of it, countless blind people are living the lives they want. The heartbeat of her life was the Federation philosophy, which gave hope and confidence to her students. Although I was familiar with Arlene from meeting her in various capacities at national conventions, I really got to know her when I became a student at the Louisiana Center for the Blind in 1989. She was an enthusiastic and capable teacher, giving me my first experience with a totally blind travel instructor. She was fearless and very creative when necessary. She taught me that it was OK in an emergency to flag down a car and ask where I was. She taught me to stop, listen, and think to work my way out of difficult travel situations. In cooking class Arlene taught me how to make a delicious strawberry pie from a recipe she got from a favorite bakery from her days in Baltimore. She once spent an afternoon with me trying to rescue a large batch of fudge I was making in which I accidently put far too much salt. We tried many remedies including boiling a potato in it to take the salt taste away, but none worked. Arlene was a very good singer, and we found time to sing together with some of the students on weekends at the apartments with me and others accompanying on guitars. She also found time to sing in her church choir on Sundays. One of my favorite memories of Arlene involved my final student project for home management. After completing all the cooking assignments, I decided that rather than just sew on a button which I already knew how to do, I wanted to make my wife a jumper as a surprise on returning home after my training. Arlene spent many hours after classes working with me to finish this project. For her efforts I taught her how to use the computer. I finished the jumper just before leaving Ruston, and my wife actually wore it a few times. When visiting LCB over the years I always found time to visit with Arlene. Another favorite memory was watching Arlene’s over the top excitement when the New Orleans Saints won the final playoff game opening the way for their Super Bowl win. Arlene’s great legacy will continue through all of us fortunate enough to have been taught and lifted by her. And I would be remiss if I did not mention Arlene’s three children, Andrea, Eric, and Valerie, whom she loved dearly and was committed to completely. She was a single mom who faced that daunting task without fear and with love, hope, and determination. Joanne Wilson, the founder of the Louisiana Center for the Blind, remembers, “Her kids were in sports, and Eric played baseball. You could always count on Arlene being at his games and cheering him on no matter what happened. She was a great mother, and my son Joel said that she was like another mother to him growing up with her kids.” Arlene was also very proud of the activities and accomplishments of her nine grandchildren who brought so much joy to her life. In 1991 the Louisiana Center for the Blind presented the first of Jerry Whittle’s plays to raise money for the summer youth programs. The title of the play was “Passing the Torch,” and Arlene played the role of the Center director, Mrs. Page. In the play, Mrs. Page challenged blind students who were coming to the end of their training to take the torch of freedom that they have been given by the National Federation of the Blind and pass it on to those who come behind them. And I am struck with the realization that, as we stand at this point in our lives, having benefited from Arlene’s life and her teaching, we hold that torch of freedom that she has passed to us. I am reminded of the responsibility that we have to pass that torch to blind people who come behind us. When a young blind mother of three children calls me, desperate to get her children out of an abusive situation, and others tell her that no judge would give her custody of her kids because she is blind, we must show her that it is possible for her to take care of her children. Hmm, I know that very well because of Arlene who provided a safe home for her three children and because of countless other blind parents we know through the National Federation of the Blind who are successfully caring for their children every day. So, how do you honor a woman who taught her students so enthusiastically, believed so strongly in their potential, and gave so freely so that others may catch the spark that would fuel a dream and inspire a life? This is the question I ponder as I write this article about Arlene Hill, a gifted, talented and well-loved teacher at the Louisiana Center for the Blind. How do you do justice to someone who lived the lessons she taught? Arlene’s passing and the passing of others is not the end of an era. It is an opportunity for those of us who remain to pass on their spirit of love, hope, and determination. We can continue the difference Arlene made in our lives by making a difference in the lives of the blind people God places in our paths. And, when we come to the end of our lives, may others say of us what we say today about Arlene, which is stated so beautifully in this Scripture: "A good name is more desirable than great riches; to be esteemed is better than silver or gold."" Proverbs 22-1 New International Version. Thank you, Arlene, for teaching me and countless others to live fearlessly.